Appearance: The worker ants range in length from 1/8 – 1/2 inch, with the queens being slightly larger. They are most commonly black, although some species are red, red and black, or brown. Habits: These ants are social insects that prefer nesting in wood. They commonly hollow out galleries or tunnels in trees, structures, wood, and foam insulation. Carpenter ants are often found in conjunction with moisture problems. An indication of possible infestation is evidence of sawdust, pieces of insulation, nesting materials, and winged adults, known as swarmers. 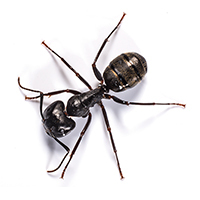 In protecting your home against carpenter ants, Dave’s Pest Control takes into account the biology of this pest and that is why we try to get people on a seasonal visit program. This allows us to get to your home before the wood destroying ants do each year. Carpenter ants have main colonies and sub (satellite) colonies. The main colony takes about five years to mature and is most often found in the woods. Once mature, the large colony needs help so it sends out swarmers (winged ants) that locate spots in the vicinity where the sub colonies can thrive. Once a spot is found, they rip off their wings and start setting up shop. Each sub colony has a job (such as caring for all the eggs or collecting water) but they are all depend on the main colony and frequently (at night) travel back to the main colony to help it out. Once mature, a main colony will continually be setting up sub colonies. Homes are ideal for them since there are reliable water sources there (we often find the colonies around window or door frames or in the kitchen or bathroom). The seasonal visit program with a trained Dave’s Pest Control exterminator does guarantee your protection from these continual, wood destroying invaders throughout the spring and summer. Diet: Carpenter ants do not actually feed on the wood. They feed actively from sunset until the early morning hours on most human foods, particularly sweets and other insects. Reproduction: Soon after mating, swarmers lose their wings. The female selects a nesting site to lay her eggs, and begins the process of hollowing out tunnels and galleries to lay her eggs. Mature colonies can range in size from 10 to upwards of 15,000. Latin Name: Camponotus. The Pavement Ant is also known as Tetramorium caespitum, which are part of the family Formicidae (Ants). They are small pests (ranging from 1/10 to 1/16 inches in length) that can be found in many parts of the United States, as far north as Canada and as far south as Florida. These pests also thrive in parts of California, Mid-West and Southeastern United States. Pavement ants were introduced to the United States from Europe and occur throughout the eastern United States. They are an important pest in the Midwest and New England. They build nests along sidewalks, building foundations, and under stones, boards, bricks, and mulch or leaf piles. Each individual colony contains thousands of workers, multiple queens and is usually located at one particular site; White Footed Ants and Carpenter Ants can have satellite colonies or build huge nests that cover hundreds of feet. This is a two-node ant (has two segments or nodes on its pedicel) and is dark brown in color. Its antennae has 12 segments (which ends in a 3 segmented club) and its thorax has one set of spines. The first physical characteristic noticed (when viewed under a microscope or 30x lens) is the lines which seem to have been sculptured on the ant’s head. These grooves are evident on the head and thorax. 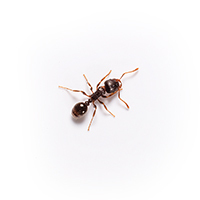 Pavement ants are one of the most common small ants invading homes. These ants readily make trails to and from food sources and often forage along the edge of carpeting or baseboards. They are also common around the base of toilets. They often nest in protected areas so the nests may be hard to locate, but this is essential to manage infestations of this species. There can be several thousand in a colony. The Fire Ant is also known as the Genus Solenopsis, which are part of the family Formicidae (Ants). 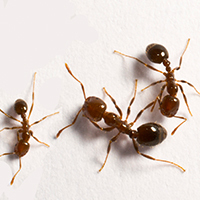 The Fire Ant society contains 2 or more worker castes of different sizes between 1/16″ and 1/4″. Their coloring is usually a dull yellow to red or black, they have large heads and incurved jaws that usually lack teeth. Their food consists of other insects, seeds, poultry, fruits, honeydew, vegetables, and flowers. Females excavate nests close to shrubs for protection from burrowing ant-eating animals, spreading large mounds of waste earth. Sometimes nests are built in rotting logs or under stones. Mated queens tend 1st generation eggs and larvae, then 1st generation female workers take care of eggs, larvae, and the queen. Their body contains a 2-segmented “waist” (pedicel) between thorax and abdomen, and fine hair mostly on the head and abdomen, and long legs. Fire Ants live in fields, woodlands, open areas, and in dry to moist soil. Their range extends from Florida and Gulf states to the Pacific Coast, north to British Columbia. Reports of devastating battalions of Fire Ants are well known in the South and Southwest. Although these ants often damage young plants, they rarely destroy established crops. Some people even consider this species a beneficial predator of insect pests. Other members of this common genus are found throughout North America but the range of individual species is more restricted. Warning stings from Fire Ants produce a painful, burning sensation. The Pharaoh Ant is also known as Monomorium pharaonis, which are part of the family Formicidae (Ants). Members of this family are less than 1/16″ long and are usually a yellow, brown, or reddish color. 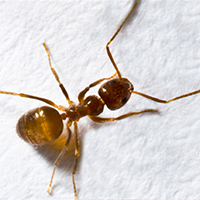 They are thought to have come to North America from Africa, Pharaoh ants can be an acute problem in hotels and inns as well as apartments and homes. These ants generally come into a structure via items shipped or brought in from an infested location. In the Pacific Northwest, the climate is too cool in the winter for them to survive out of doors. Inside, they can nest in wall voids, behind baseboards, under furniture, or under stored items in cabinets or closets. Food sources range from sweets to protein-based foods. Pharaoh ants can only be effectively controlled through a comprehensive baiting program. Treatment with liquid insecticides actually makes the infestation worse by causing the ants to “bud” or “split” into several smaller satellite colonies. There are many excellent baits on the market for pharaoh ant control. The more successful baits contain pulverized silk worm cocoons as an attractant. They also contain a slow-acting poison that gives the worker ants time to get back to the colony and feed them. The silk worm cocoon seems to be one of the only attractants for pharaoh that works. Again, it must be emphasized that spraying makes Pharaoh ants worse. The Crazy Ant is also known as Paratrechina longicornis, which are part of the family Formicidae (Ants). These ants are known as Crazy Ants because of their characteristic rapid and erratic movement. The worker ants have extremely long legs, making them relatively easy to identify. Yellow Crazy Ants are yellow-brownish in color. They are present in American Samoa, Australia, Brunei, China, Christmas Island, Cocos (Keeling) Islands, Cook Islands, South East Asia, Federated States of Micronesia, French Polynesia, Guam, India, Indonesia, Japan, Kiriabati, Malaysia, Marshall Islands, Mauritius, Myanmar, Northern Mariana Islands, Papua New Guinea, Reunion Island, Samoa, Seychelle Islands, Sri Lanka, Taiwan, Thailand, Tokelau, Tonga, Tuvalu, USA, Vanuatu and the Wallis & Futuna Islands. Crazy ants (Paratrechina longicornis) were introduced to the United States from India. Their distribution is limited to the Gulf coast from Florida to Texas. They are easily identified by their long legs and their habit of erratically moving from place to place (hence the name “crazy”). Crazy ant trails are not readily obvious because of this erratic movement. The easiest way to find the nest is to look for workers carrying pieces of food or workers with swollen abdomens. These ants are carrying food back to the nest. By observing their movement, it should be possible to find the nest. Crazy ants are highly adaptable and will nest in a variety of locations, from very dry to moist. They will nest under objects, in rotten wood or trash, in tree cavities, as well as in debris left standing in buildings for long periods of time. These ants feed on a variety of foods including grease, sweets, and other insects. In some areas they are considered a biological control agent for houseflies. While crazy ants need moisture, elimination of water by itself will not get rid of these ants since they can survive under a wide range of conditions. Elimination of food sources and nest sites are equally important in the management of this ant. Crazy ants do not respond well to baits, so they cannot be relied upon for management of this ant. Surrounding buildings with vegetation-free barriers such as stone or brick (but not wood mulch) will keep ants from entering buildings to nest.